Not only do these wraps help prevent injury and are hugely functional, the prominent Villain logo and choice of colours adds a touch of personal style to your gym outfit. I LOVE these! I had borrowed my husbands one day and they truly helped with my chest day. I actually felt stronger because I wasn’t focused on trying to keep my wrists straight. Any who... we bought a pair for me and, while they took me a sec to figure out (I am blonde), I swear by them! Bench 1RM 165... I’ll take it! Hi Kira !!!!! Life is GREAT when your bench numbers go up!! So glad to read that your new Villain wraps are helping you! Thank you very much for being a member of the #TUFFWRAPSFAMILY !! Best wraps I've ever had!! These wrist wraps are stable and just all around a great support for all movements. They are great for me for the support since I broke my wrist, but my over all favorite thing about these wraps is being able to tighten them down from the first part of the wrap without having to reset anything because of the belt loop set up. I recommend these to any and everyone. Definitely worth the money. Hey Lee!! This is really awesome feedback! Thank you so much for your support! #BLESSUP and keep working hard in the gym. #MUCHRESPECT ! I am currently on my third pair of wraps...and not for the reason you think...these things are made well!!! Actually..and I swear to this..may dog got a hold of my blue line version of wraps so I needed to replace...currently rocking the red and gray which I alternate with the camo. Design always raises an eyebrow from the random person..but also never fails to ask where i got them. Love the support they offer without the hassle and pinch of the stupid thumb loop. Solid design on the velcro closure and the stitching for damn sure isnt going anywhere anytime soon. Original pair have been put through the paces for about 6 months and still going strong! Hi Edward!!! This is truly an #AWESOME review!! We really appreciate you taking the time to give us your feedback. Thank you so much for your support and for being a very valuable member of our #TUFFWRAPSFAMILY !! I've only used tuffwraps since I started lifting. Thanks to gymzilla and Leroy the machine. Hope to see yall again at the expo in Houston this july! Much Respect Garrick !!! We see you consistently working hard and you support #TUFF . 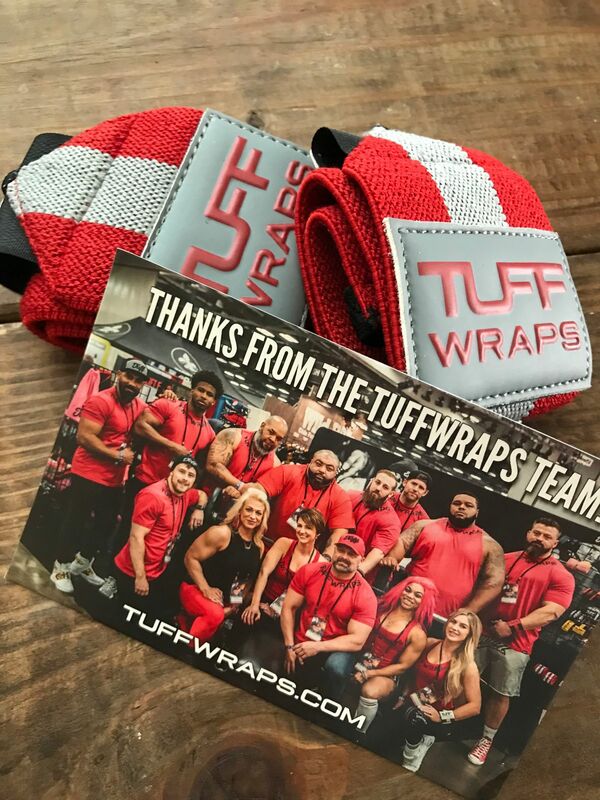 You are #tuffwrapsfamily !!!! #BLESSUP ! !